The Summer Term 2017 had been a long time coming: the finish line of a marathon course which started in 2013 with the Government announcing a phased return to tough two-year linear A-levels and a major reform of the GCSE system, additionally to increase their rigour. 16 year-olds nationwide have now taken new GCSEs in English Language, English Literature and Maths, while Upper Sixth Formers took new A-levels in around half the subjects on offer. The remaining subjects will complete the reform process at GCSE and A-level over the next two years. 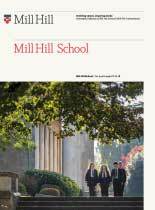 The university and higher education destinations are excellent, with the range of courses and institutions reflecting the individuality, passion and diversity of interests that are nurtured at Mill Hill. Courses include Maths, Economics, Natural Sciences, English, Modern Languages, History, Politics & International Relations, Medicine, Engineering in various specialisms, Business, Design, Visual Arts, Music and Fashion Management. The majority of leavers will be studying in the UK but four are heading to the United States and one to the Netherlands. Five will be starting at Oxford or Cambridge, respectively reading English, History, French & Linguistics, Spanish & Arabic and Classics. Another example of a student achieving entry to a first-rate specialist institution is a young woman who made the journey several years ago from China to board at Mill Hill, who is now going on to study History of Art at the Courtauld Institute of Art. Their GCSEs done, these students now proceed into the Lower Sixth Form, where they will be joined by over 40 new joiners, to experience the exciting pre-university ambiance of our brand-new Sixth Form Centre and to engage in their choice of 25 different A-level courses plus a wide range of options in our inspiring Enrichment programme. Away from the taught curriculum, a large number of Millhillians of different ages have taken part over the year in external academic competitions of various sorts: from Schools’ General Knowledge, French Debating and Spanish Drama to Olympiads in Maths and the Sciences. A particular highlight this year has been the excellence shown by students in the Design Technology Department, where three current Sixth Formers hold Arkwright Engineering Scholarships, three Fourth Formers and a Sixth Former won categories and three others were runners-up in the Teen Tech Awards, and four Remove pupils were runners-up in the Design Museum Ventura Award. Millhillians’ learning at School was again enhanced by a wide variety of educational visits. Many went out on a one-day basis in London and elsewhere in the UK, such as a range of lecture days or a trip to the Jaguar Land Rover factory in the West Midlands. Others have gone further afield, for example to practise their Modern Languages skills in France and Spain, to study the geography and geology of Iceland first-hand or to descend into the bowels of the Large Hadron Collider at CERN on the Franco-Swiss border (they did come back).